How Does YouTube's Algorithm Work? What is the goal of YouTube’s algorithm? Just like Google, YouTube’s algorithm aims to provide searchers with relevant, personalized videos. There are five separate sections of YouTube where this algorithm works: Home, Search, Recommended Videos, Trending, and Subscriptions. That means that for each of those sections of the interface, YouTube works to present users with options that they’ll love. But how do they know what videos their audience will love? That’s where the algorithm comes in. Similar to the way that Google no longer accepts keyword stuffing, YouTube wants to see videos that are created for your audience instead of trying to beat the system. You shouldn’t load your descriptions with keywords or create videos that you think the platform will like. Creating videos for your audience and your audience alone is enough to catch YouTube’s eye. Let’s talk about each section that you can rank in on YouTube and how you can get to the top of each. Home results refer to the results that appear on your home screen when you first log into your YouTube account. The recommended results appear on your home page and come in the form of single videos and channels. What have they watched before? Do they mostly listen to music? What channels do they frequent? The second part of the algorithm focuses on the interaction between top videos and similar users (to the one you’re targeting). For example, YouTube might have a group of users that consistently listen to the same band on YouTube. From there, they’ll choose the videos that are most-watched by this similar audience and rank them highly for users. One great thing about YouTube’s home page suggestions and recommended videos is that it won’t just suggest the same videos and the same channels. The algorithm knows and understands that users are interested in more than one thing and will create suggestions based on all of their previously watched videos. YouTube suggests that in order to rank in the “Home” section of their platform, you should aim to keep users engaged for as long as possible. It doesn’t matter whether you post a few long videos or a ton of short ones, the goal is to keep people interested and engaged in your videos. This increases the chances that your video will be featured on the home page. In order to rank in the “Recommended” section of YouTube’s interface, they suggest that the end screen of your videos close with a strong call to action that suggests your next video. The algorithm for trending results pulls videos that are new and popular in a specific country. Trending videos are never sponsored, meaning users can’t pay to have their video shown in the trending results. Some videos on the trending list are expected. These are videos like a new song, but others can be based on things like rate of growth in views and where views are coming from. YouTube suggests that to rank in the “Trending” section, you should make videos that are widely relatable, broadly appealing, and easily shared. When you create these kinds of videos, they can reach tons of different audience besides your subscribers. Search results appear when you search for a specific term. 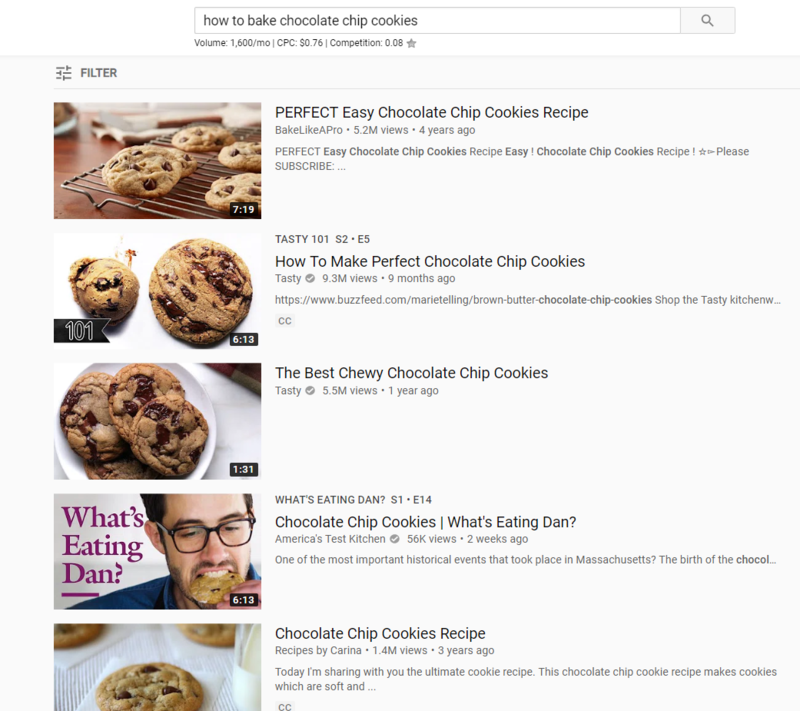 For example, if you search “how to bake chocolate chip cookies,” the results you see are a result of the search. But how does YouTube choose what videos get those first-page spots? For search, it’s mostly based on the relevance of your video to the user’s search, as well as the keywords that you use in the title and description. When they deliver these results, they obviously want to ensure that the keyword or a variation of the keyword that the user searched is present in your video’s title and/or description. Not only that, but the algorithm also takes a look at whether or not the user has watched your videos before. In order to rank in search results for keywords that are featured in your video, be sure to write extended descriptions for your videos that feature that keyword. Be sure to not keyword stuff, or write content that isn’t relevant to your video, though. When someone subscribes to your channel, they can visit their subscriptions page and see all the newly uploaded videos from all the channels they follow. In order to rank a user’s subscribed channel results, YouTube uses view velocity, which is a number that quantifies the number of subscribers that watch your video right after it’s published. Your videos will rank higher depending on how high your view velocity is. View velocity isn’t the only part of the subscriptions ranking algorithm, though. YouTube also considers the number of followers your channel has when ranking your videos! Be genuine when you ask for subscribers. Users have a better reaction when you explain the benefits of subscribing to your channel and how your channel supports you. Do you need help optimizing your videos for YouTube’s algorithm? WebFX is a full-service digital marketing agency that understands the importance of not only highly-ranked content, but also highly-ranked videos on platforms like YouTube. If you’re interested in optimizing your video descriptions and titles, getting more views, and creating stellar videos, we’re here for you.